Hello friends! Today I have some odds and ends to share and it just so happens that everything is pink. As a matter of fact, at this very moment, as I sit here typing this post, it looks like a pink explosion happened on my dining room table: pink fabric, pink sari ribbon, pink tulle and my newest angel dressed in pink. 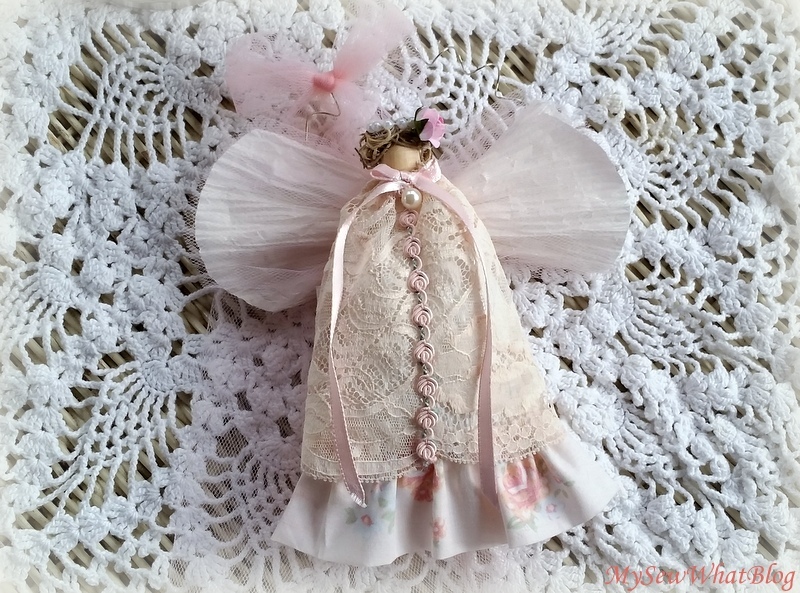 I haven't made an angel ornament in months and I have been suffering from angel withdrawal so this afternoon I put one angel ornament together in a sweet little pink vintage-style print fabric. 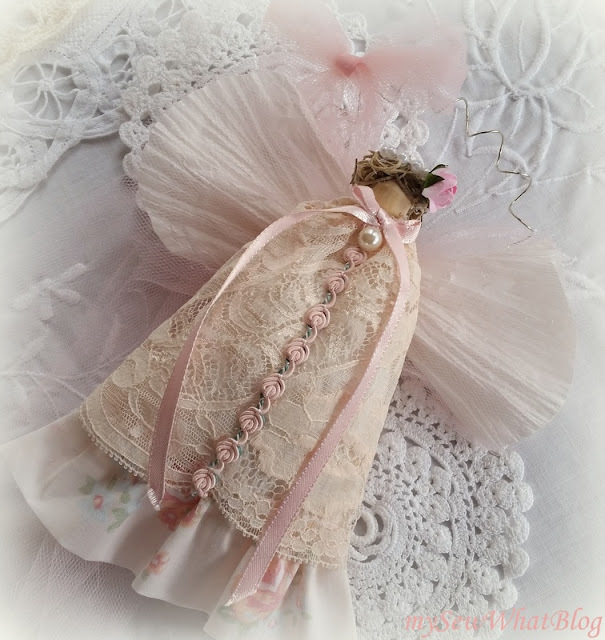 I used a very wide pale pink lace for her robe. I purchased a large bundle of this lace at an antique shop--it appears to me to be a lingerie lace and it has a nice scalloped edge and a slight discoloration from age which only adds to the look I was trying to create. 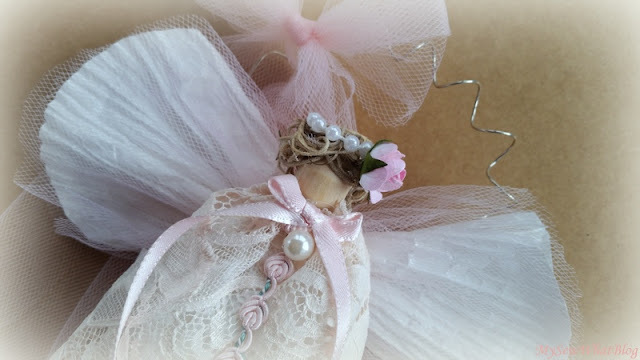 The wings are constructed from two layers of white twist paper and two layers of pale pink tulle. She wears the usual faux pearl halo and a little paper rose in her tousled Spanish moss hair. I used silver wire for her hanger and attached a pink tulle bow. .......Anyways, on Friday, my dear friend picked me up and we went antique shop-hopping and out for breakfast. We went to three little shops and I spent a whopping $15.00. On what? 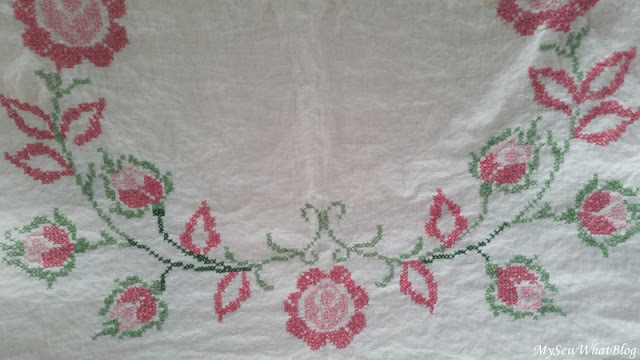 Well, first I found this beautiful 60" x 90" cross-stitched, linen tablecloth. 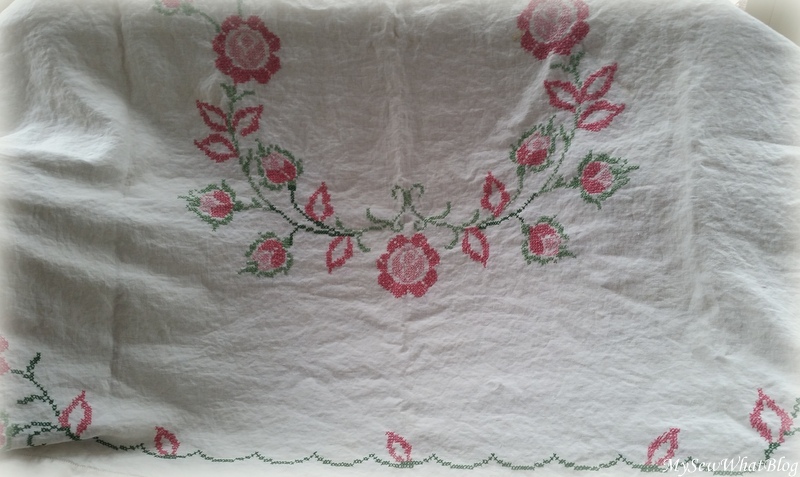 I absolutely love this tablecloth! 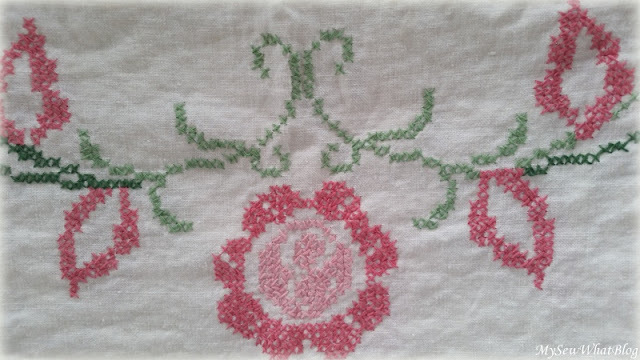 I washed it and when I took it out of the dryer it had that wonderful linen feel to it! Do you know the "feel" I am talking about? It's a very nice quality linen and well worth $5.00. The cross-stitching must have taken forever to complete. 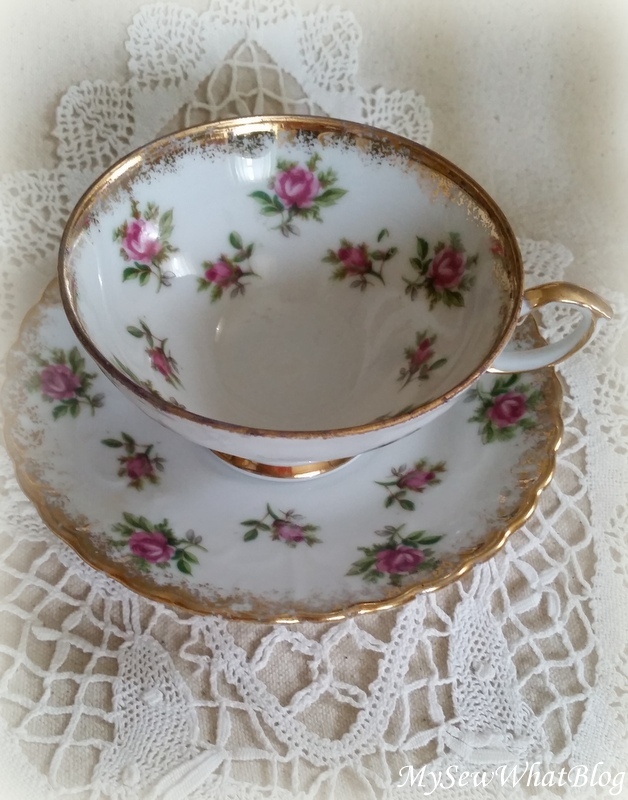 I also bought myself two tea cups that were $5.00 each. This one is very sweet and dainty. I love the little pink rosebuds. I sure do enjoy shopping for tea cups and adding them to my collection. I thought I would only collect twelve and then begin collecting mismatched plates as I would also like to collect a complete set of mismatched china. But when I got my twelve tea cups I didn't want to stop....or maybe I can't stop! You can't really ever have too many tea cups anyways, right? Well folks, my hands are frozen so it's time to stop typing so I can go run my hands under some hot water. It's downright cold here. I woke up to a dusting of snow and more is on the way for tomorrow. Just two days ago it was 71 degrees.....par for the course here in New England. PS Stay tuned for Stephanie's Tea Cup/Mug Swap Reveal--sometime towards the end of April. 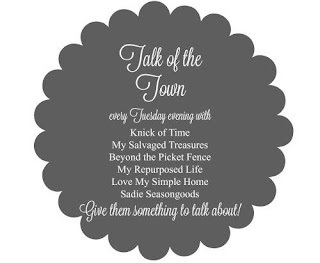 Thoughts of Home Thursday --be sure to check out all of these amazing blogs!